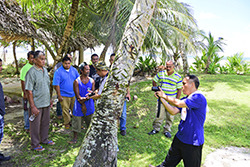 A Coconut Cultivation and Pest Control Technology Workshop Sponsored by the Chinese government was held in the four states of Micronesia, starting with Yap in June, followed by Chuuk and Kosrae, and ending in Pohnpei in July. The workshop, conducted by the Chinese Academy of Tropical Agricultural Science (CATAS), was well facilitated by the Chinese Embassy and the FSM Federal Department of Resources and Development. More than 90 courses in the four states, covering the aspects of varieties of coconut, coconut processing, coconut pest control and so on, were given by professors from the academy. More than 100 trainees attended the courses. Coconut is called “the Tree of Life” in the FSM. “FSM is very rich in coconut and other tropical plants, but in FSM, we only have coconut forest but no coconut plantation,” said Liu Guodao, the vice president of the CATAS and the team leader. Most of the trainees, after this workshop, said they had mastered some basic and useful knowledge to improve the coconut production. Chinese Ambassador Huang Zheng, the Acting Secretary of Federal R&D Hubert Yamada, the Assistant Secretary of Federal R&D Marlyter P. Silbanuz and the Assistant Secretary of Federal Department of Foreign Affairs Brendy Carl attended the closing ceremony in Pohnpei and handed the certificates to the trainees. The Deputy Chief of Mission of Chinese Embassy Li Cuiying attended the opening ceremony of the workshop in Yap and introduced the agricultural cooperation between China and the FSM. develop better and better and develop together with China. Next year is the 30th Anniversary of the establishment of diplomatic relations between China and the FSM. I believe that there will be more and more similar exchanges between China and the FSM, which will continue to benefit the two peoples and consolidate the friendship between the two countries and build our promising future together.